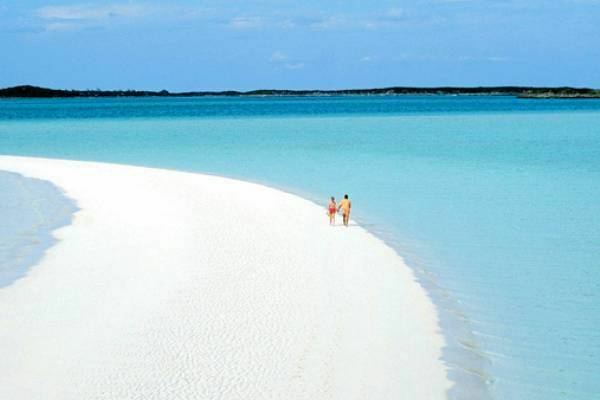 Exuma is a district of the Bahamas, consisting of over 365 islands, also called cays. The largest of the cays is Great Exuma, which is 37 mi (60 km) in length and joined to another island, Little Exuma by a small bridge. The capital and largest city in the district is George Town (population 1,437), founded 1793 and located on Great Exuma. 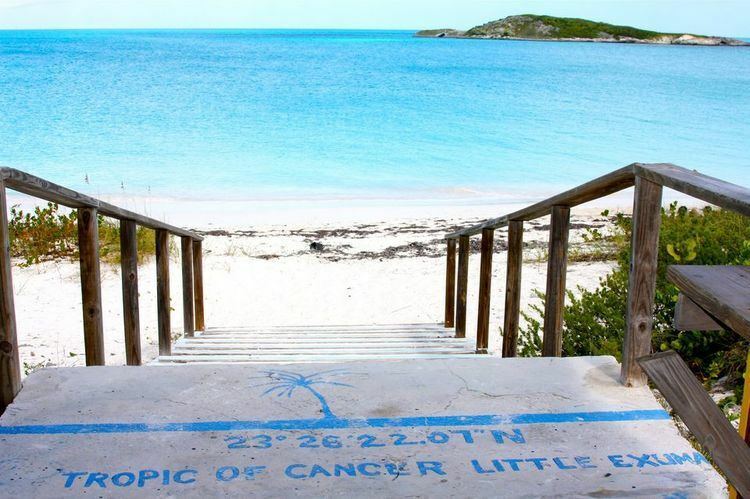 The Tropic of Cancer runs across a beach close to the city. The entire island chain is 130 mi (209 km) long and 72 sq mi (187 km²) in area. Great Exuma island has an area of 61 sq mi (158 km²) while Little Exuma has an area of 11 sq mi (29 km²). Between 2000 and 2010, the population of Exuma more than doubled, reflecting the construction of large and small resort properties and the related direct air traffic to Great Exuma from locations as distant as Toronto, Ontario, Canada. The population is 6,928. Exuma was settled in or around 1783 by American loyalists fleeing the Revolutionary War. The expatriates brought a cotton plantation economy to the islands. George Town was named in honour of George III, to whom the settlers maintained their loyalty. A few smaller cays still remain partially or wholly privately owned, albeit they are still referred to as part of the Exuma–Bahamas Cays; they are distinguished by a three-digit suffix number. The best known examples are adjoined cays Exuma 642 and 643, which are suffering from receding shorelines. John Rolle, 1st Baron Rolle, a major Loyalist settler of the Exumas, is a major figure in the islands' heritage. Upon his death in 1842, he bestowed all of his significant Exuma land holdings to his slaves. As a result, towns on Great Exuma such as Rolleville and Rolletown were named after him. The islands are a popular spot for yachting, sailing, diving, and coral reef and cave exploring. Many of the unnamed beaches and coves of the islands, including extensive offshore reef areas, are included in the protected Exuma National Land and Sea Park of the Bahamas National Trust. Some of the islands on which there are permanent residents and resorts include Staniel Cay (home of the Staniel Cay Yacht Club, a fixture in the Exumas), Fowl Cay, Musha Cay and Iguana Cay. Thunderball Grotto, located just a few hundred yards off Staniel Cay, is one location where the James Bond film Thunderball was filmed. Sandy Cay, just a short boat ride from Little Exuma was the location used for filming the Pirates of the Caribbean beach scenes and a Shell commercial. The novel Wind from the Carolinas was set in Great Exuma. The Exumas are the historic home of the Lucayan Natives, who were wholly enslaved in the 16th century, leaving the islands uninhabited until the 18th century. In the intervening period, the Exumas provided many hideouts and stashes for pirates. Elizabeth Harbor was a favorite lair of Captain Kidd. Exuma International Airport serves the city of George Town directly from Nassau, Miami, Atlanta and Toronto. Staniel Cay also has a small airstrip. Boat travel from Nassau to the Northern Exuma Cays is approximately one hour. From Nassau to Pig Beach is 89 miles (143 km) and takes 2 hours by speed boat. The Exumas are known for fresh food and cultural significance to The Bahamas. The islands are a Climate resilient community. Sea life regularly caught for commercial purpose include bonefish, conch, grouper, lobster, marlin, sailfish, snapper, tarpon, tuna and wahoo. The George Town Fish Fry is a collection of businesses that open at night - serving a variety of menus and meals. It is popular among local residents. The capital city, George Town, is home to many different shops and services that serve both the travelling public and residents of the islands. The islands have built a reputation as a luxury travel destination. The telephone area code for the island is 242. Known as the "Grey Ghost", bonefish can be found in the flat areas covered by as little as one foot of water. Their fair colouration is perfectly adapted as camouflage against the sandy ocean bottom, making the fish difficult to spot in spite of the clear Bahamian waters. Anglers may employ spin casting equipment, but more often opt for fly-fishing in their hunt. The annual Bahamian Music and Heritage Festival is highly anticipated in The Exumas by tourists and islanders alike. The festival focuses on the food, arts, and music of the local culture. In 2017 it was the site of the Fyre Festival, a luxury music festival which became notorious online and in the media for its shambolic organization. Because the population is so tiny, there is a small traditional media industry. 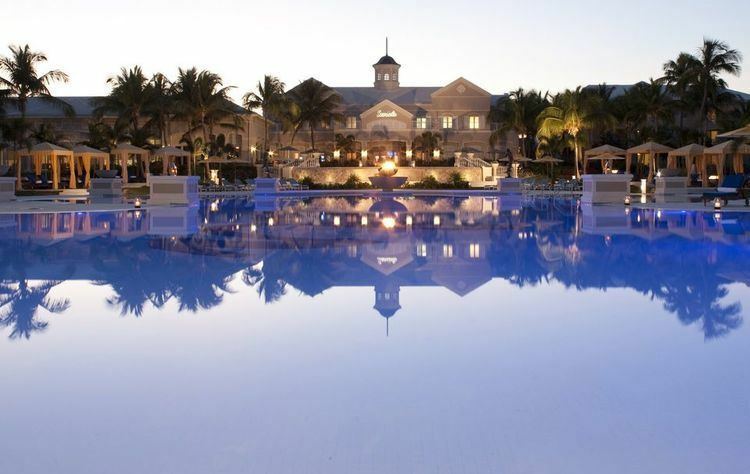 The Bahamas is served by many newspapers, radio stations and web sites, whereas the local media in George Town consists of Exuma Breeze FM, and a collection of mostly smaller business websites which publicize the much-needed tourism industry. The Chain is a free newspaper published monthly and is the 'one source for current and accurate information' on the chain of islands. St. John's Baptist Church was built in 1892; St. Theresa's Church was built in 1960; St. Andrews Anglican Parish is the oldest church in Georgetown. The Baptist church of Farmer's Hill ordained Rev. Stephen Smith in 2015. Rev. Smith 'supersedes' Dr. Irvin Clarke Sr., who has been pastor for the past 45 years. The culvert at Farmer's Hill is being repaired, with sustainable development by an islands construction company. Sandals Emerald Bay offers an 18-hole championship golf course designed by golf pro, Greg Norman. Emerald Bay is home to Great Exuma Classic on the Web.com Tour. This course was once named by Travel & Leisure as "Best Golf Course in the Caribbean". Sailing is a popular sport in Exuma and there are many competitions year-round. The Family Island Regatta in George Town is a recurring event at the beginning of every year. Others include the George Town Cruising Regatta, Black Point Regatta and more. For fishing-enthusiasts, the Exumas offers many fishing tournaments. Rowing is also being introduced and developed in Exuma with the aim of developing the island as an outlet for competitive and recreational rowing. Running has been brought to the island with the Run for Pompey; an international event with an ultra-marathon, marathon, half marathon and 10 km road race. Kiteboarding - Exuma is one of kiteboarding's best kept secrets spots. Known for it's crystal clear waters, consistent winds and flat-water, Exuma is a kitesurfers paradise, with optimum conditions for beginner and advanced kiteboarders ... best of all, there are no crowds. Exuma Kitesurfing offers IKO certified kiteboarding lessons and Kiteventure trips. The windy season in Exuma is November through Apri. There is also a brief trade winds season July through mid-August. The main island has been a haven for celebrities for years. Until recently, the tourist population on the island was extremely minimal, allowing anonymity for anyone escaping the spotlight. Frequent visitors included Princess Margaret, Countess of Snowdon, who stayed at the Goat Cay home of Babbie Holt, Jackie Onassis, Jessica Tandy and Hume Cronyn, and Sigourney Weaver, who vacationed there with her family. In light of the relatively low cost of purchasing islands and the relatively low Bahamian tax regime for non-locals, a number of rich people from America own islands in the Exumas. These include Aga Khan, Nicolas Cage, David Copperfield, Ali Daei, Johnny Depp, Faith Hill and Tim McGraw, Ali Karimi, Eddie Murphy, Eddie Irvine and Tyler Perry.